SENSORS : Most machines have these to monitor whats happening. Sensors for eyes! That's a good idea. Wouldn't factories look much better if the machines were disguised as wild animals? Sensors for eyes! That's a good idea. Wouldn't factories look much better if the machines were disguised as wild animals? Imagine a cut & crease machine as an Elephant or Hippo, a folder gluer as an Alligator. Red light photocells for eyes and a proximity switch for the knobbly bits on Alligators face and nose. Ultrasonic detection on passers by to breath laser fire from the mouths. Now wouldn't that be cool! Well I think it would! As pretty much every basic machine has an eye or two and some of the more complex beasties have considerably more, as you probably know only too well! 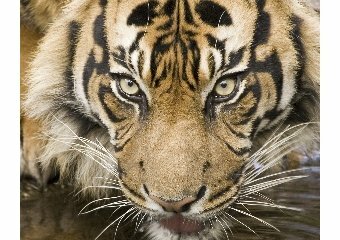 They are the eyes of your tigers, your tigers of course meaning the production machines. As I said, even the little tiger cubs have eyes too you know. A sensor is a device that converts a change or point of motion into a readable electrical signal, they are a type of transducer. The symbol given to them on circuit diagrams is normally a representation of what the specific sensor is or does. Most of them are electrical or electronic, but other types do exist such as a mercury thermometer, one of these is said to be 'direct-indicating' and are human-readable. Other devices can't be used alone like the thermometer and must be used in conjunction with a processor/display of some kind. For instance a thermocouple which converts heat into an electrical signal proportionate to the temperature will need an controller with an indicator or display to operate. Sensors are used in industrial automation everywhere and in everyday life at home and at work. Applications include auto mobiles, aerospace, medicine, industry, robotics and not forgetting machines of course. There is a myriad of manufactures of all different types of sensors, some manufactures specialize in certain types. Others cover the general run of the mill stuff, some manufactures just supply certain sectors of industry with specific specialized devices such as the aviation industry and the military. The multitude of types of sensor include photocell, capacitive and inductive proximity, varying types of heat detectors, laser sensing, motion/inertia devices, ultrasonic and many more. Photocell sensors are one of the most frequently found types of eyes, they are more commonly referred to as the magic eye, yeah yeah ok, you got me; they're not really an eye in comparison to a camera. Even so, they can see using infrared or visible light, by seeing I mean they give a signal out when an object is placed within the visible range of the photocell. Light is emitted from the photocell and reflected back at it by the detected object. The reflected light is measure by a light-sensitive device in the photocell, depending on the intensity of the light received will determine if the signal (output) is switched on or not. As such, the signal or output you would get from this type of photocell would be a 'yes it's there' or 'no it's not there' type of response. This may not seem that useful but it is, as this is the response that most sensors will give. The clever bit is how good a photocell is at determining how and when this signal is given! This type of photocell are called retro-reflective photocell, as they don't utilize a separate reflector or light receiver. They detect using just the light reflected back from an object within its range that the photocell has put out. The best situation to use this type of photocell is when no other objects are within it's visible range apart from the object of attention being detected. This one above is a fibre optic photocell, it uses two pipes of glass (called fibers), to emit and receive light for the detection purpose. This is the reason the name of this type of photocell is a 'fibre-optic'. The two fibers will be plugged into a controlling amplifier and the output signal will be given from this device. Variations on this retro-reflective type of photocell we have been talking about are reflective, through-beam and laser to mention a few. I can tell you I was really disappointed not to find light sabers in there somewhere!! Proximity switches are very much like the photocell above only, it's blind! No it doesn't have a white stick on the front of it but it does work by touch. Well ok, not quite by touching, but it does detect objects in very close proximity to the sensors face. Yep, totally correct, that's where its name comes from. Damn you're good! Proximity switches, or proxy's (as they are more often than not, referred as an abbreviation), are available in all sorts of shapes and sizes. The most common shapes I have come across is the barrel type, ha ha no not beer barrel shape, I wish. The barrel proxy is a cylinder shape like a battery, 'AAA' to 'D' sizes all catered for. Also in long and short lengths too. They can be found both threaded with a standard thread size, or with a plain shank to allow nipping in place with a grub screw for instance. Other shapes include the V3 type micro switch pattern, like this one here, as a direct replacement for upgrading machine controls from a micro switch to sensors. You can see this one is sensing the bolt head as its output light (LED) is on. There's also long skinny proximity switches that slide into the sides of air cylinders and work off the cylinder position by sensing magnetism. In fact if you had a one of each shape of proximity sensor that's available, they would probably look like a bag of liquorice allsorts! Absolutely loads of 'em there is! There are two main types of proximity switches you will hear about, that's capacitive and inductive. Ok, so what's the difference? Hmmm, well in operation, nothing at all, it's all to do with how they detect objects, the object usually being some type of metal for inductive. Inductive proximity switches work by producing a magnetic field and the magnetic types of metal will change this magnetic field when moved into the sensing range. Capacitive proximity sensors work like an electronic capacitor, two plates in close proximity each holding a charge will influence each other. In this case our sensor is one plate and our non-magnetic metal object (aluminium, brass etc) is the other plate. If I could just mention a word about outputs. Ok three to be exact! The output wire of the photocell or proximity switch is where you'll find the output signal waggling up and down when you have it powered up and make it switch on and off. The signal on the output wire could be labeled 'output' or 'signal' or maybe even 'here it is' (ok maybe not that one! ), this is where it's all happening. This is the main event! The output is after all what sensing is all about. All of the transducers I've touched on so far are what's called the switching type. That is to say they give a "go/no go" type of signal. Yes, this is what I've mentioned earlier. That kind of 'yes it's there' or 'no it's not there' type of response. Albeit the switching point is very precise and more importantly reliably repeatable. Important to mention here, the repetition of sensing results is a very important factor of any sensing device. Without consistency, that is repeatable results, any and all of 'em would be in fact next to useless! An output type that may not seem to fit this rule is another type of 'sensing output' category. None of the little chaps above fall into it and this is the analogue output family of sensors. The same rules of repetition of output and consistency also applies to this breed of course but, the signal on these analogue output devices infinitely varies between two given points. You could think of it like a needle going up and down. On a DC (direct current) voltage output type, for example you may see a voltage varying between zero and ten volts. On an AC (alternating current) voltage type, the output could, for example be a varying frequency. For arguments sake the limit points could be 10Hz to 50Hz. You should be of the belief by now that the analogue output crew are a more refined type of eye with a depth of vision so to speak. Useful yeah? A classic example of an analogue output sensor that every mum will have encountered, probably without knowing the tribe it belongs to. Or anything else about it for that matter, is the ultrasonic scanner. The word Ultrasonic in the realms of sound is making reference to frequencies above audible sound, this basically means above human hearing... What! As I was saying, this is normally taken to mean any frequencies over 20kHz, or 20,000Hz (20,000 cycles per second). However, the frequencies in use for medical diagnostic ultrasound equipment can go up to 10MHz (ten million cycles per second) and beyond. This is probably the most commonly known of all the ultrasonic sensing family, is the baby scan unit! Sounds in the frequency range 20-100kHz are commonly utilized for navigation, communication and warnings, by bats and dolphins and also by some other species as well. Ah ha, and guess what! This is also generally the frequency range used by electronic detection and range sensors. Ultrasonic sensors use very high pitch sound waves, well above human hearing range in a very similar manor to a bat flying around. Under normal atmospheric conditions, the speed of sound is 769mph or 1238 km/h. This ultrasonic noise is blipped out of the sensor at the rate of 20-40kHz, this is called the sample rate and is the speed the rate of change is measured. The sound blips are bounced off any nearby surfaces and time taken from sending a blip out to hearing an echo is measured . From this the distance or presence of an object of any type can be calculated. Clever eh! The specific sounds used are produced by special ultrasonic transducers, (they can be crudely thought of as solid state loud speakers if you like). There is a wide variety of medical diagnostic to general automation types of electronic sensor applications, but pretty much all of them use, either or both, the echo time and the Doppler Effect of the reflected sounds to measure distance and reproduce form. A typical example is the Echo cardiogram, with one of these devices, a moving image of the heart is produced actually in operation, in a type of video format. Using false colours and brightness to build a picture indicating speed and direction of flowing blood and the hearts live valve movements. Ultrasonic sensors have been used for range and sizing measurement sensors since they were invented, or at least, for a very long time. Applications for ultrasonic sensors include such things as tank or hopper level control, press web brake and proximity detection, distance measuring and the like. You can see this ultrasonic sensors label clearly here, it shows the model number, connection example, supply voltage and current limits. Also the connector pin out, so you can wire it up correctly. Most important! 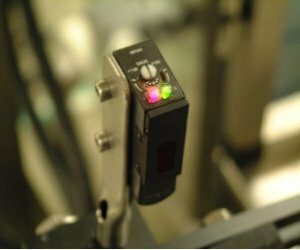 Ultrasonic sensors in automation circles, are best put to use in difficult environments, where there are challenging reflective surfaces or the need for extreme accuracy render traditional optical sensing devices unsuitable. Go from here to Machine 'In the Box' page. Return from Sensors to Machine Information Systems Home page. <!- Clickbank Ad-Link Water4Fuel --> ARE YOU TIRED OF RISING FUEL PRICES!! !